Because stir fry sauces are honestly just unnecessary. Here’s how my life works: I’ll go months and months with making lots of healthy foods, have hardly anything processed in my house, then go to Trader Joe’s when I’m super tired or hungry and be like I NEED CANNED TIKKA MASALA. Not that there is anything wrong with this thought, but I’m perfectly capable of making it myself, usually have all of the ingredients on hand, and enjoy cooking. It just hits me sometimes that I want premade stuff. Currently I have TWO jars of premade curry sauce in my pantry from two different stores that will probably sit there for 6 months because I can’t remember for 2 days that I’ve purchased something. Luckily I have two. All that to say….I don’t ever buy stir fry sauces. I think they serve a place in the world, but I find that making stir fry is so quick and easy that it’s just not worth the extra cost or space in the cabinet to keep sauces around. I love chopping up veggies, whisking sauce together, and seeing dinner finished so quickly because the veggies are just barely cooked so they stay crisp, and the sauce thickens almost immediately from cornstarch. 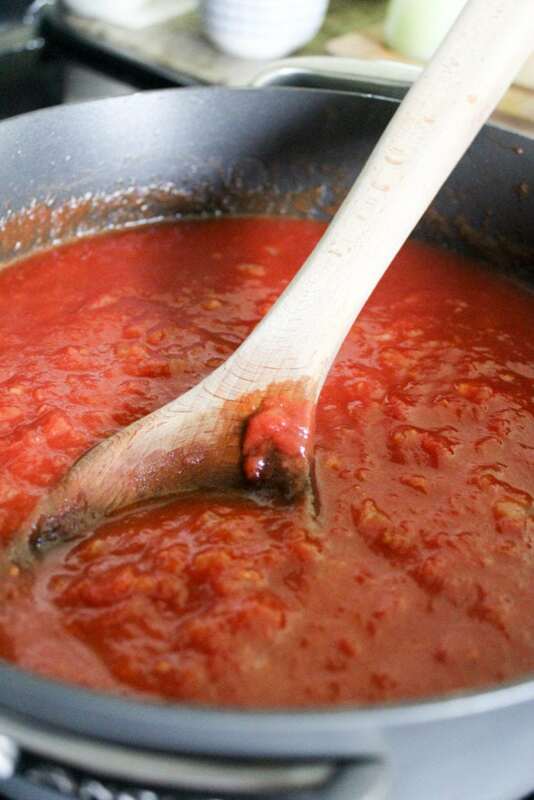 This particular sauce is very basic in preparation and taste. When I made it the last time, Jay said “this is not a bad thing…but this tastes just like takeout.” I consider this a compliment because no matter how big of a health game we talk everyone secretly loves Chinese takeout, right? Don’t deny me this belief, I can’t be alone in this. 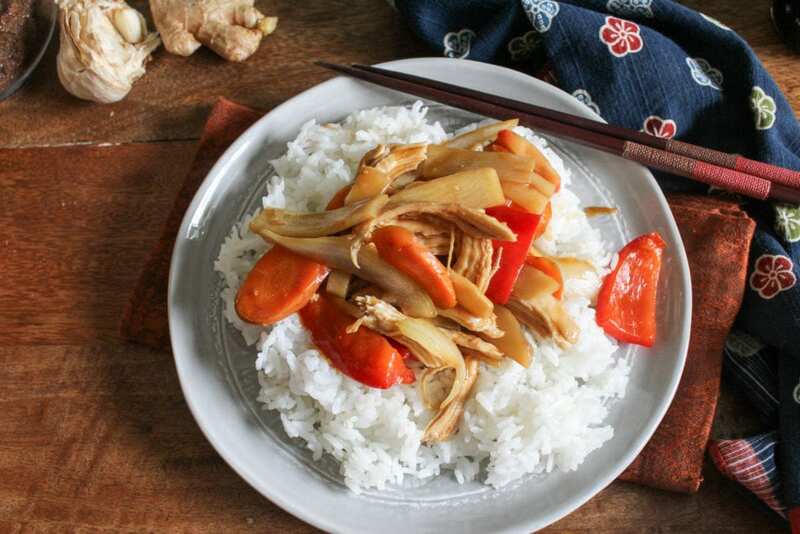 But Chinese takeout is one of those things that we eat very rarely for health reasons, so having a similar sauce that you can make super quickly is helpful to curb the sodium cravings. In case it wasn’t clear, I am very into tomato-based things. Not at the moment. All the time, in all the ways. It’s been one of my favorite flavors for my whole life, but I realized that in the post on the basic marinara that I love so much I basically only talked about pasta because duh. So I wanted to show you another way I use marinara, in quick side dishes like this. I love this because it of course tastes familiar but is a nice change from either roasted veggies, stir-fry stuff flavored with soy sauce, or sauteed veggies with olive oil + salt + pepper. Those 3 options are kind of tried and true in our house and by tried I mean tired sometimes, right? Enter tomato sauce. I stew veggies in the marinara with some extra onions, garlic, and chicken stock (or veggie for anyone who doesn’t eat meat), make a protein and some kind of carb to go with it, and end up with a lovely, healthy side dish that is great to use up any veggies or extra sauce I have in the fridge. 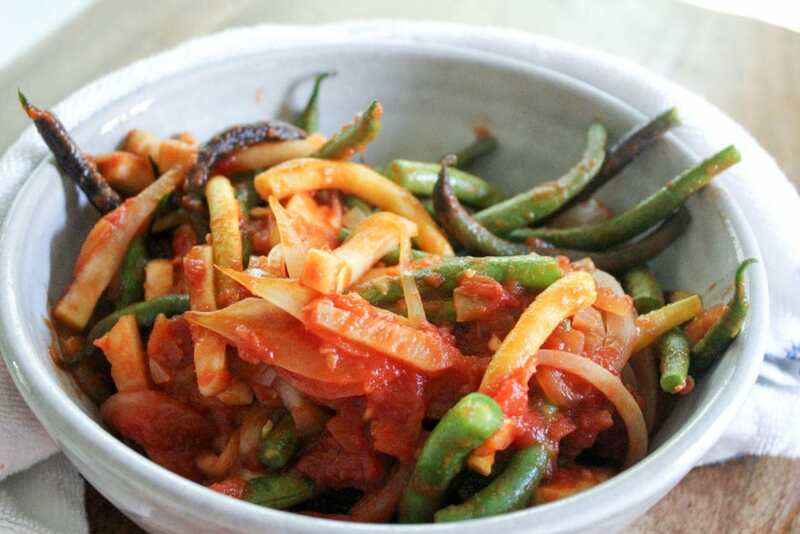 I used green beans in these pictures, but I love this with squash, zucchini, peppers, and eggplant just as much. Any veggies you like are the veggies for this – it can be different every time but still so simple. I’ve written about this before, but one of my favorite things to have on hand in my fridge is marinara sauce. We’re lucky to have a few great fresh pasta makers in our little city, so we almost always have frozen pasta in fun flavors that boil in 3 minutes. If I already have marinara in the fridge or freezer dinner becomes even easier, but still feels like I’ve made it myself because…I kind of did. No knock at all on jarred pasta sauces, but it’s so simple to make your own (and cheaper! and less chemicals!) that I prefer to make big batches of it, keep some in the fridge and some in the freezer, and call it a day. I did this when I was pregnant and it was so nice to have on hand for quick pasta. I toss it with shredded chicken or cooked ground beef to serve over pasta, bake it with some cooked pasta and dollops of ricotta and shredded mozzarella for a quick ziti, or throw it into lasagna for a weekend meal. This was stolen directly from my neighbor Leah, who hosted a fabulous Memorial Day party for a bunch of people on our street this year. It’s ridiculously simple, which honestly is how I think all watermelon dishes should be. Throw some feta on there every once in awhile, sure, but watermelon is so wonderful on its own, especially this time of year when it’s actually in season, but mainly a few teeny flavors over the most perfect summer fruit is all I need. I know some people are iffy about salt on fruit, and I hear you. Sometimes it doesn’t work. Here, though, it definitely does. 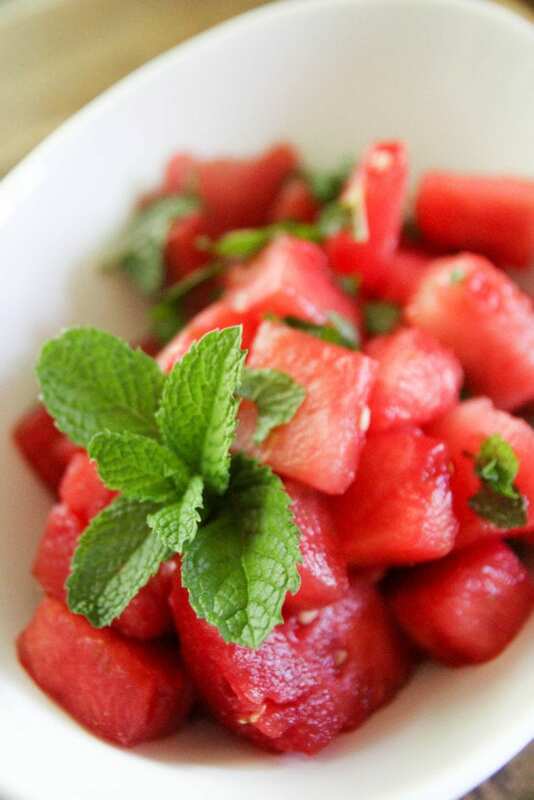 The super sweet melon with just a teeny bit of salt really bring together the spice of the cayenne and the freshness of the mint, and lime zest over the whole thing just feels right. 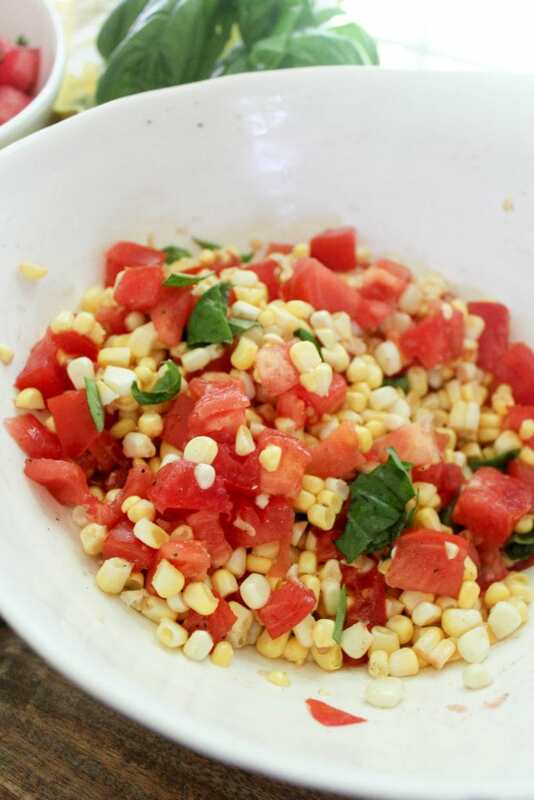 It’s one of those perfect 5-minute raw summer dishes that feel fancy, take zero effort, and taste amazing. Raw and vegan. Because vegan feels easier in the summer, to me at least. Hey, hi! Hope your weekend was great. We did super low key with farmer’s market, lots of walking, eating, photographing food, golf, and wine. It was glorious and prepped me for 3 full weekends of busy we have in front of us. Fun, but still busy. Whether or not you’re a practicing vegan, I hope you’re someone who enjoys summer produce as much as I do. I have to admit that I find eating seasonally somewhat boring in the months where lettuce and beets are the only things really locally available, when it’s so tempting to go to the store and buy anything you want to eat, even if it doesn’t taste that great. In the summer I don’t have that problem at all because there are so many amazing fruits and veggies coming straight of the ground all around us.